It’s a cool title, albeit weird. 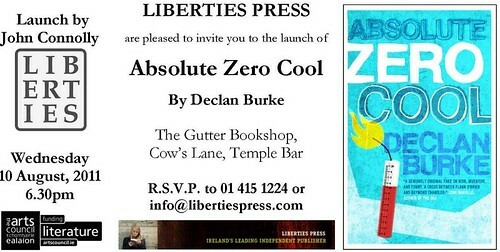 I’ve read Absolute Zero Cool, except when I did, it was called something else. Declan Burke (yes, it’s him again) keeps working on his novels, and this one he’s been twiddling with for nine years, or something. I still need to read it in its new form, but the paper version has not reached me yet. It can reach you, dear reader, if you pop along to the launch in Dublin. Which is at The Gutter Bookshop (and how apt is that?) on August 10th. I won’t be there. Declan forgot to clear the date with me, so I’m busy. And you know, you could always pop along just to see John Connolly, who is launching the book. I imagine it will be the usual champagne bottle banged against the book and away it goes. For a noir crime novel about a hospital porter trying to blow up a hospital, it’s got a really cool cover, wouldn’t you say? Generally I don’t approve of that kind of behaviour, but seeing as the weirdo is called Karlsson he’s got some sympathy from me. Let’s just say the novel is anything but average, and quite possibly the launch will be un-average too. 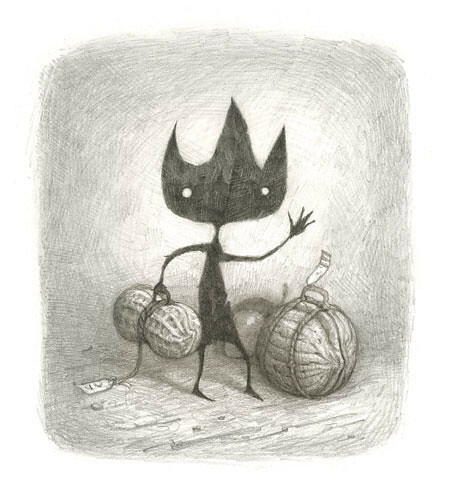 It’s been an intense sort of week. After posting several ‘political/foreign’ book reviews, and after all that happened in Norway, I feel we need peace. 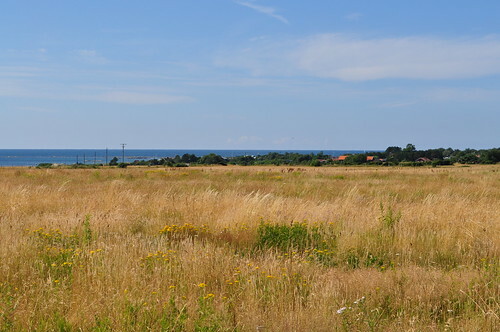 These fields with the sea in the distance are beautiful and calm, but with no specific significance. Just what we need. This new novel by Alan Gibbons is the perfect book for male readers. I hope that doesn’t sound wrong. There are not enough male teen novels, and this one is of political as well as human importance. Young people need the kind of good example someone like Alan can set them. It’s about war, but a more real kind of war that feels far removed from the Andy McNab type of war. It’s also a very working class story, which made me realise quite how middle class (or ‘worse’) much fiction is. Chris and Imran are neighbours and they grow up together. They are the best of friends and they always do things together, until terrorism and politics and religion get in the way and they eventually go their separate ways. Chris becomes a soldier and goes to fight in Afghanistan. Imran is found by religion and risks being brainwashed into terror deeds. An Act of Love begins at the end, almost. We are then taken back to various stages in the boys’ lives from about age eight. The reader finds out what happened to the two of them. This way it’s clear how much we are all pawns in a much bigger game. I hope it will show young readers that they need to think for themselves and to learn to value friendship. We see the fears of the Millennium bug, then travel in time via the 11th September in New York and the 7th of July in London, before arriving in the war which is still being ‘fought’ and looks like it won’t ever end. Evil and prejudice will always be with us in some form or other. But hopefully this book can give us some hope. It’s funny how Imran’s mother describes herself as a Yorkshire girl, shocked at encountering racism and being told to go back where she came from. The pace makes for breathless reading as you approach the end. Having begun at the end, the plot moves towards what ultimately has to happen, after twelve years of back-story. Imran and Chris are still teenagers, and they have both seen too much. I hope this book will open many eyes. Eric is the tale of a foreign exchange student, which covers the same ground as many of us have experienced, either as the student or as the host. It can be horrible, but it can also be quite wonderful. We are all so different, while still fundamentally similar. And it’s not always easy to work out how to behave. This lovely little book by Shaun Tan proves what a worthy winner of the Astrid Lindgren award he is. It’s mainly pictures, with few words. That doesn’t make it a young children’s book, though. It’s a thought-provoking story that can help us see what is important in life. Eric is a most unusual visitor, and his hosts are unsure whether he is happy or not. But they do try hard, and offer him many experiences. Divided City is the book I missed six years ago when it was published. I kept meaning and meaning to read until time ran off elsewhere. Theresa Breslin’s book popped back on my radar with it being turned into theatre, performed by school children from Glasgow, a couple of months ago, and I read it around the time of this year’s Orange walk, which is something I have always more or less avoided thinking about. I can do that because of where I live and because I’m not a Catholic. Now, though, it’s become rather more real for me. Having recently read a number of books about friendships over some border other, this is particularly interesting in a way. To the innocent outsider, Glasgow is homogenous and I don’t see the difference between Protestants and Catholics. I know you have it in Ireland and I know about Celtic and Rangers. Don’t understand the deadly seriousness of a game of football. That’s all changed now. Theresa’s story about two football-crazy Glasgow boys, one from each side, has taught me a thing or two. She included a ‘real’ foreigner by having a young refugee from the other side of Europe, who puts everything in perspective, and who is the catalyst for what happens. But, it’s the two sides of Glasgow that really matters. I am clearly not totally useless, because I could tell from their names which boy was which ‘kind’. Graham is the better off financially, and he is considering going on the Orange walk with his grandfather. Joe leads a totally different life, with less money and less creature comforts at home. On the other hand he lives surrounded by a big and involved family, and he is anything but clueless. Both boys are equally ‘prejudiced’ about the other side, but circumstance and football bring them together, and their refugee does the rest. Glasgow comes off well in this tale, with lots of interesting people. And to begin with it felt easy ‘knowing’ what’s right and what’s less so. Only, it’s not that simple. Had no idea Theresa knew so much about football, either. This was a good piece of education, on top of being a wonderful read. I loved those boys. The year isn’t over yet, and my Foreign Reading Challenge certainly isn’t. But, in the interview with Julie Bertagna back in June, I suddenly got this great idea, and it won’t sit around and wait its turn. Julie was saying how she went looking for Scottish books for the children she taught in school. They wanted to read about ‘themselves’, and she had no idea it was going to be almost impossible to find such books. As Julie said, Theresa Breslin had written one. And that was pretty much it. So she wrote a book for ‘her’ children. And then she wrote a few more. Now there are plenty more Scottish books, not only by Julie and Theresa, but by countless other Scottish authors. To the English it might seem unnecessary to have Scottish books, since they are all in the ‘same’ language and set on the same green island, but that’s far from true. Irish books are different from English ones, and there is no reason why there should be no need for Scottish books as well. I do read plenty of Scottish novels, but I see no harm in setting up a separate, personal challenge to find many more. If teachers can sit down and write books for their pupils, then I can have a blog challenge. Here’s to The Scottish Book! And unlike with The Scottish Play, we can say MacBeth as much as we want to. Not that I want to. I’ll say MacBertagna! MacBreslin! And all the rest who I’m not listing in order to avoid forgetting to mention them. This is the ultimate journey book. I think I was crying by page two, which might be a record even for me. 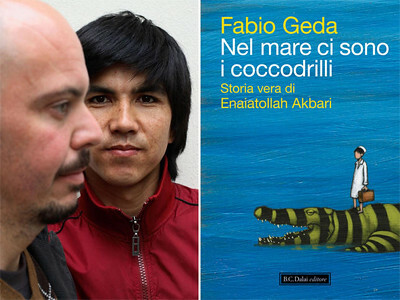 And what makes this book by Fabio Geda stand out among journey books is that it’s true. OK, it’s described as fiction. But it is also described as the true story of a young Afghan’s journey to Europe. So, I don’t know what constitutes the fiction in this lovely book, unless it’s simply the smaller details, smoothing what is a very rough trek. I aim to find out, though, as Fabio and his ‘main character’ Enaiatollah Akbari are going to be at the Edinburgh Book festival in August. Back in 1999 Enaiatollah’s mother took her ten-year-old son from their Afghan village to Pakistan and left him. If you look at it from the point of view of a small child, it’s a cruel thing to do. But looked at from a mother’s perspective, it’s deeply upsetting, but you can also almost see the necessity of her actions. Before leaving she made Enaiatollah promise never to use drugs or carry a weapon or to steal. This lovely and polite boy had to work out for himself what to do, and by hard work and with much courage he spent five years doing badly paid jobs, slowly inching closer to Europe. You hear so much about refugees and human trafficking, but you tend to think of it as one short, if horrendous, journey, which will be over in the foreseeable future. Enaiatollah worked and worked, and made it to Iran. Then there is the repatriation problem, where you are found and sent back. More than once. He ‘just’ worked some more and covered the same ground yet again. Five years later he arrived in Italy, where he has remained. It’s also where he met Fabio Geda and told him the whole story of those years. The book is very simple. It’s Enaiatollah telling Fabio everything as he saw it at the time. He has an astounding memory for detail. Occasionally Fabio asks him questions and the reader is able to see how they talk about what’s important and what isn’t. The question is whether things ended happily for Enaiatollah. From a western point of view it did. But just because things aren’t bad for the now (perhaps) 22-year-old, it doesn’t mean they are good. And there is his mother to consider.